How to set up and use Bizimply with the Epos Now integration. Log in as an administrator to your Bizimply account, click on your name/email in the top right-hand corner and choose "App Centre" in the drop down menu. Here you will be able to see the apps that you can use in your account. 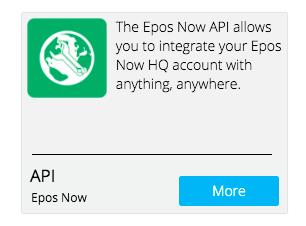 To the left you will see "Integrations" and when you click here you will be able to find the Epos Now app listed. Click "Get" to install the app. Once the app is installed you can click on the settings icon (The cog/gear that is visible in the picture above) to get to the settings for that app. Here you will have the option to input your Epos Now API Key. 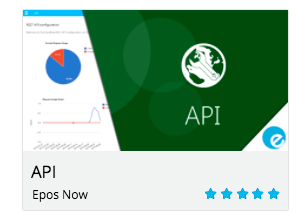 Once installed go back to your apps, click on the API app and select the Rest API option. You will be able to find your devices listed here, just click on the Access Credentials button. Here you will be able to find the authorization token you require for Bizimply. This token works for every device in your location so it only needs to be added once. Copy and paste this back into the settings section for the Epos Now app in Bizimply as shown above and click save. If you have more than one location you can do the same as above - each Epos Now location has their own apps and settings. Once setup you can add another API key to Bizimply by selecting "Add Another API Key" button and simply paste the "Authorization Token" from your other location. There are two main ways this integration can be used. 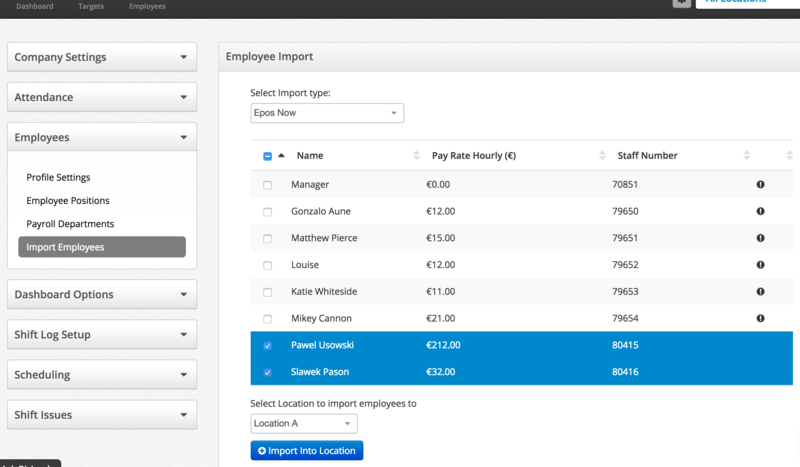 You can now easily add your employees to Bizimply once they are in your Epos Now system. Go to the import employees section of your settings (Admin access is required). All your employees will be listed with their pay rate and staff number. You will also see a warning icon for employees who are already in the system (This is based on the staff number already being in use). Click the "Import Into Location" button. You will receive a confirmation pop-up that these have been added and are now available in the employee tab of your Bizimply account. This requires a little more setup process but once complete, you will not have to change a thing. Go to the Sales Import section of your settings (Admin access is required). You can add multiple devices to a single sales area, for example if you wanted to see all your sales in one figure, just add all your devices to a single sales area. Once all that setup is complete you will be able to fetch the sales automatically on the Shift Log for each connected sales area. You will see the ability to add the Epos Now sales to the sales area with a click of a button when filling out the shift log. You can also see the till opening and closing information if you hover over the information icon. If you have any questions or need some help setting this up just let us know, we would be happy to help.